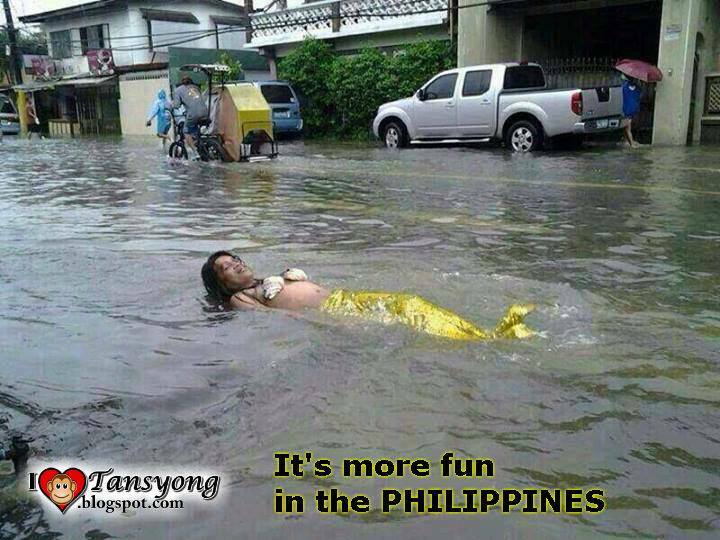 Despite of Typhoon“ Maring” Filipinos are still Smiling. Devastating Situation, innumerable casualties, millions of properties were damaged, so on and so forth. Those are scenarios that usually we can notice in our surroundings if Typhoon exists. In addition to that, floods in metro, not just an ordinary flood, but a flood that will totally ruin the Filipinos’ hope. Philippines is surrounded by many oceans, basically it is facing in Pacific Ocean wherein Typhoon are usually started. Therefore, Philippines is a country that can be easily hit. It is given, so Filipinos are expecting that phenomenon annually. 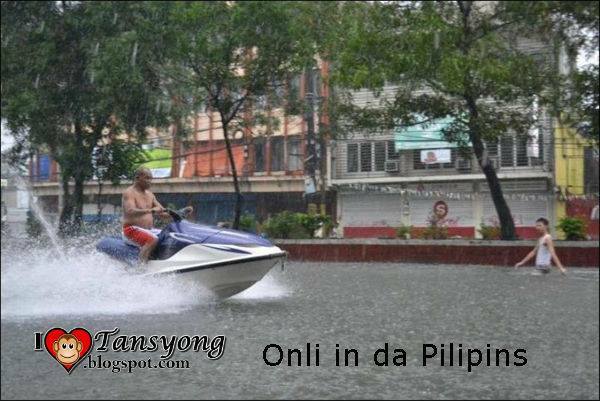 Actually, part of being a Filipino is to experience the heavy rain, strong wind, and a flood that will enter in every house. 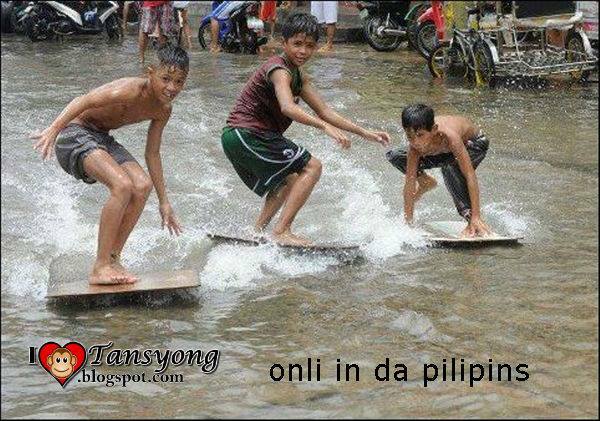 But despite of the typhoon, let me give you some reasons why Filipinos are still smiling during this phenomenon. 1. 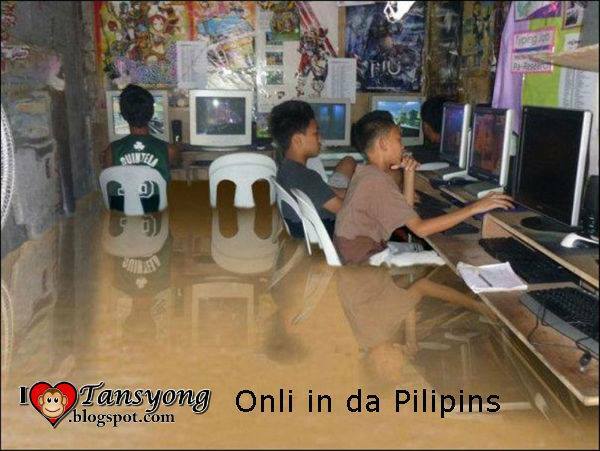 Because of the heavy rain, Filipinos can’t go outside. Therefore every members of the family can have a chance to bond each other. They are enjoying their hot lugaw, or mami in a dinner, and they simultaneously watching the news and they will have a chance to talk about their life which is not the normal habit due to their busy individuals’ life. 2. Bayanihan, Pronounced like "buy-uh-nee-hun," bayanihan is a Filipino word derived from the word bayan meaning town, nation, or community in general. "Bayanihan" literally means, "being a bayan," and is thus used to refer to a spirit of communal unity and cooperation. 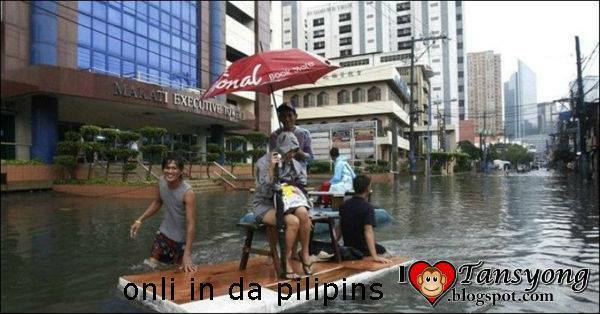 In time of crisis like typhoon, the spirit if bayanihan arises and that’s the reason that we are proud as a Filipino. Being a selfless is innate from within and we tend to help others without expecting in returns. 3. Being Creative, Remember the saying that “need is a mother of all invention”. 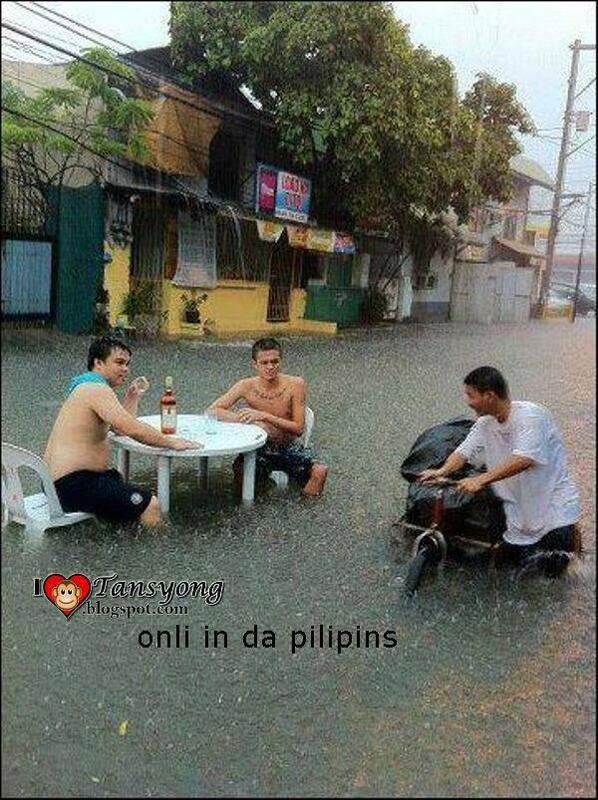 Filipinos creativity exists when need is arises. 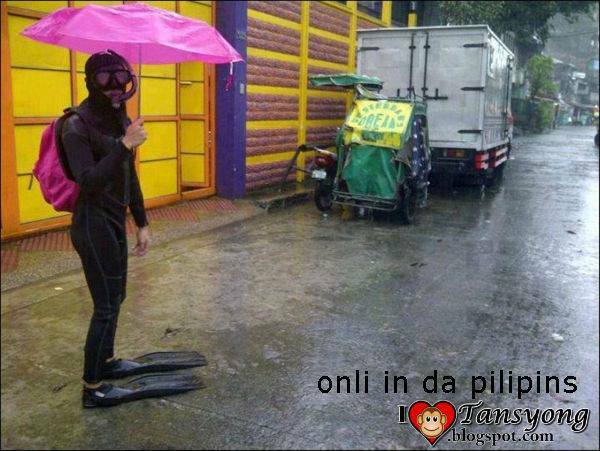 Filipinos are smart and we can easily create new things from out of nothing that can play a huge role during typhoon. 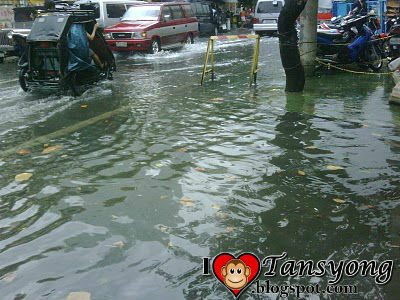 The Second Day of Typhoon Maring while I’m walking in the middle of the flood at EDSA-Taft Rotonda. I noticed few boys were doing a small bridge so that the people can easily pass with a certain amount. By that, they used the catastrophic flood as a source of income. Very smart Right? Moreover, I was also surprised when I received an EMAIL from my friend with an image attachment. 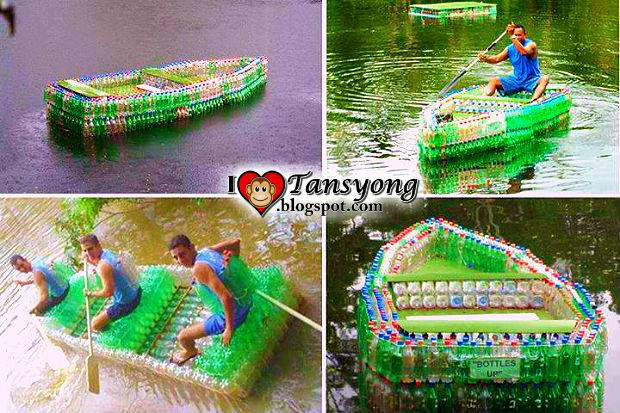 Men in a boat made up of empty bottles. Great Idea! 4. 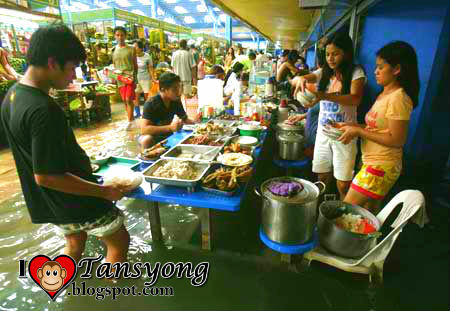 Cleansing the Philippines: Many pessimists are complaining why flood exists. Positively speaking I answered “Just think of it positively, maybe your house is too dirty and that will be the time that you can clean it. Imagine, without flood, you don’t even have time to clean your house. Same thing outside in your house, without flood government will not get a chance to find ways of solving it. There are reasons why flood exist, so don’t think negatives because with or without typhoon, it’s all the same. Life is risky with or without typhoon.” Our environment becomes clean. 5. Employees are highly priority; companies are offering free accommodation to their employees, they also offering calamity loans, financial assistance, and free food subsidy during work for a specific span of time. Employees can take advantage of that. Hope you’ll enjoy it. Smile Filipinos! More Power! Hahahahahahahhahha, grabe lahat ata ng tao kahit nasalanta astig parin na kikibka at tumatawa sa gitna ng baha ee, lumalabas din yung pagiging malihain nila lalo na yung mga bangka ni gingawa nila. LOls. 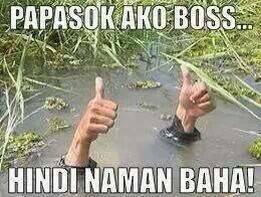 I love the pics na kumlat sa net habang umuulan. :) Sayang hindi mu nasama yung Conjurain, lols. Thanks steven for droppin by. Bukod sa pagiging masayahin likas din na matulungin ang mga. Ito ang ipinakita ng mga OFW sa Qatar na miembro ng iba't ibang organisasyon doon. Nagkaisa sila para makapagpadala sa mga nabiktima ng bagyo.